The decadent autobiography of HANOI ROCKS co-founder Andy McCoy, “Sheriff McCoy: Legend of Hanoi Rocks”, in English for the first time in a deluxe hardcover edition through North American publisher Bazillion Points. Touted as “the last great rock ‘n’ roll memoir,” McCoy’s autobiography covers the legendary guitarist’s life and exploits from childhood through the early 2000s rekindling of HANOI ROCKS. Growing up in Sweden and Finland, McCoy helped introduce punk to Finland with his teenaged band Briard before befriending glamorous Michael Monroe and forming HANOI ROCKS. After living in a Stockholm subway station, the band embarked on wild life-changing and death-defying thrill ride around the world, touring not just Europe, London, and America, but also Israel, Brazil, Thailand, and Japan. After HANOI ROCKS dissolved following the death of drummer Nicholas “Razzle” Dingley in Hollywood in December 1984, McCoy carried on with SUICIDE TWINS, CHERRY BOMBZ, a successful solo career, and a stint as a sideman to IGGY POP. A national icon in his native Finland, McCoy has been called the Finnish Keith Richards — except Richards only fell out of a coconut tree; Andy McCoy fell from a fourth-story balcony and lived to tell the tale. His over-the-top image and streetwise bending of punk, glam, and old-fashioned rock n’ roll inspired a generation of platinum-selling bands–rock authors Slash of GUNS N’ ROSES and Nikki Sixx of MOTLEY CRUE have already admitted their musical and stylistic debts. Now the real McCoy speaks from the heart on subjects including rock stardom, true love, his arsenal of vintage guitars, and surviving every imaginable variety of intoxication. 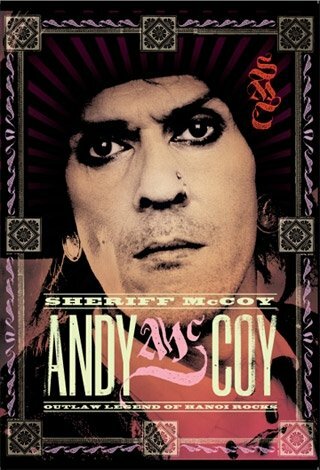 The English edition of “Sheriff McCoy: Legend of Hanoi Rocks” by Andy McCoy from Bazillion Points includes dozens of rare candid photos, a deluxe embossed cover, a lengthy select discography spanning three decades of rarities, and a new 2009 preface written by McCoy after the final breakup of HANOI ROCKS.